Sony Computer Entertainment has just released another upcoming shooting games’ bestseller – Resistance 3. 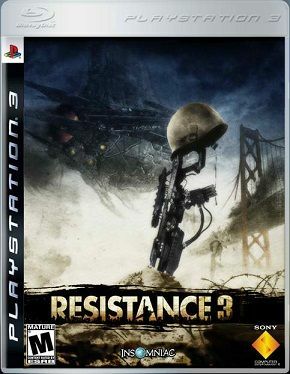 The 3rd installment of the Resistance series, Resistance 3 was released exclusively for PS3 users. Love shooting games? This is for you. If you aren’t familiar with the previous Resistance releases, allow me to inform you that they are among the best shooting games ever released. You are playing Joseph Capelli, a discharged covert ops specialist. This first-person shooter game will definitely get you hooked – especially if you are longing for action, suspense, and excitement in one game. Resistance 3 combines action and sci-fi thrills as the goal will be to survive and fight for your life from alien invaders. If you are familiar with the previous Resistance games, then you know Enemy Al. He has been upgraded to a much more challenging and surprisingly dangerous character. What else can you ask for? This is indeed one of the best PS3 deals you can ever get. It also allows online multiplayer shooting, which will get you thrilled to the next level. Aside from the single player campaign, it also gives you the the online and split-screen co-op options. As per progression, Resistance 3 won’t be left behind. Your character will get to improve as you play more often. You can even opt to go for the death match mode wherein you will be up against other online players. How cool is that? Resistance 3 is indeed among the hottest and most awaited shooting game of PlayStation players. A real great PS3 deal you cannot say no to. Gaming has never been this fun. Shooting games has never been this fun. So don’t forget to check out the comeback of a classic – Resistance 3. Previous articleiPhone 5 – What should you look forward to?